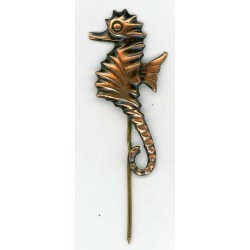 Latvian stickpin There are 107 products. 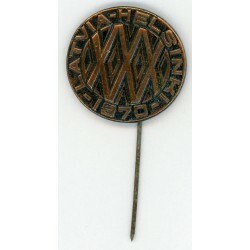 The stickpin of the Latvia existence 5-year anniversary in a good condition, circa 1923. Title- Latvia existence 5-year anniversary, 1918-1923, L.A.B Dimensions - 26.5 x 22.5mm. Weight -2.55 gr Material - brass. 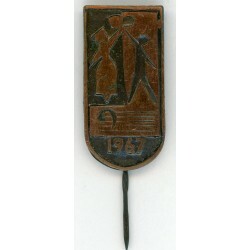 The stickpin of the Latvian Harvest Festival in a good condition, circa 1935 Title- Harvest Festival , 13.X.35 Dimensions - 22 x 19 mm. Material - brass. 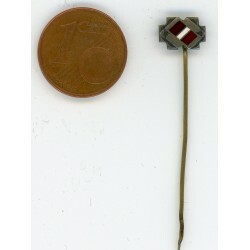 The stickpin with the Latvian flag in a good condition. 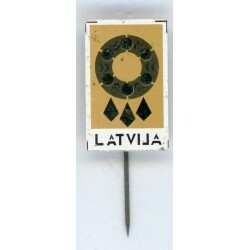 Title- Latvian enamel flag without title. Dimensions - 9 x 5mm. Material - brass. The Latvian soviet stick pin (mini) in a good condition.Circa 80ies of 20th centure. Consistent with its age, Please see scans! Title- without text. Dimensions –apprx. 19 x 11 mm. 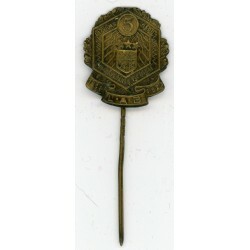 Material - brass with enamel. The pictures are from actual item that you will recieve. 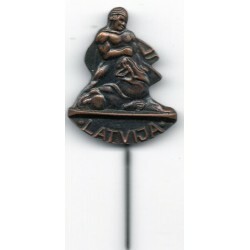 The Latvian National Guard`s stickpin in a good condition. Title- without title,letter "L"and 3 stars. Dimensions - diameter 10 mm. Material - brass. 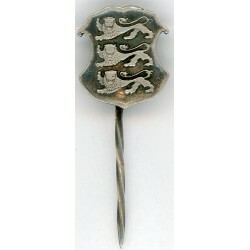 Stickpin with Estonian national symbol - tree lions in agood conditions. 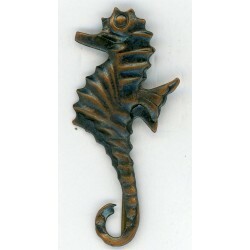 Title- without title,with 3 lions.. Dimensions - approx.17 mm x 16 mm. 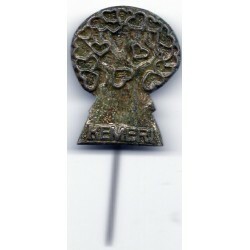 Material - silver(925). The Latvian soviet stick pin "Liepāja"
The Latvian soviet stick pin “Liepāja” in a good condition.Circa 80ies of 20th centure. Consistent with its age, Please see scans! Title- Liepāja. Dimensions –apprx. 12 x 16 mm. Material – brass. The pictures are from actual item that you will recieve. 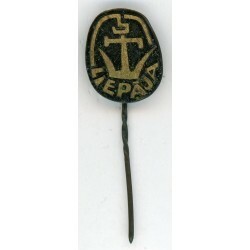 The Latvian soviet stick pin “Liepāja” in a good condition.Circa 80ies of 20th centure. Consistent with its age, Please see scans! Title- Liepāja. Dimensions –apprx. 17 x 15 mm. 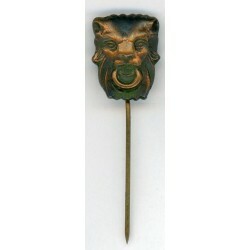 Material – brass with enamel. The pictures are from actual item that you will recieve. The Latvian soviet stick pin "Liepāja "
The Latvian soviet stick pin “Liepāja” in a good condition.Circa 80ies of 20th centure. Consistent with its age, Please see scans! Title- Liepāja. Dimensions –apprx. 23 x 13 mm. Material – brass. The pictures are from actual item that you will recieve. 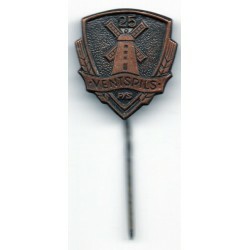 The Latvian soviet stick pin "Ventspils "
The Latvian soviet stick pin (mini) “Ventspils” in a good condition.Circa 80ies of 20th centure. Consistent with its age, Please see scans! Title- Ventspils. Dimensions –apprx. 11 x 12 mm. Material – brass. The pictures are from actual item that you will recieve. The Latvian soviet stick pin "Lielupe"
The Latvian soviet stick pin “Lielupe” in a good condition.Circa 80ies of 20th centure. Consistent with its age, Please see scans! Title- Lielupe. Dimensions –apprx. 13 x 13 mm. Material – brass. The pictures are from actual item that you will recieve. The Latvian soviet stick pin "Sigulda"
The Latvian soviet stick pin “Sigulda” in a good condition.Circa 80ies of 20th centure. Consistent with its age, Please see scans! Title- Sigulda. Dimensions –apprx. 13 x 13 mm. Material – brass. The pictures are from actual item that you will recieve. 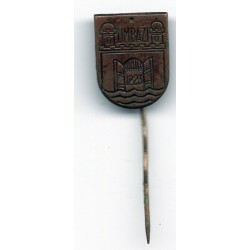 The Latvian soviet stick pin “Sigulda” in a good condition.Circa 80ies of 20th centure. Consistent with its age, Please see scans! Title- Sigulda. Dimensions –apprx. 10 x 15 mm. Material – brass. The pictures are from actual item that you will recieve. 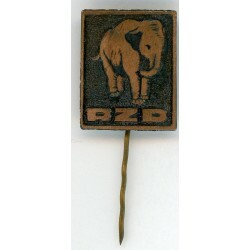 The Latvian soviet stick pin Rigas Zoo“RZD” in a good condition.Circa 80ies of 20th centure. Consistent with its age, Please see scans! Title- RZS and zoo symbol. Dimensions –apprx. 19 x 11 mm. Material – brass. The pictures are from actual item that you will recieve. 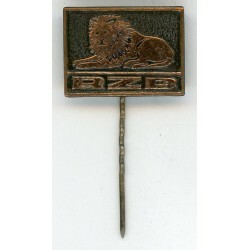 The Latvian soviet stick pin Rigas Zoo“RZD” in a good condition.Circa 80ies of 20th centure. Consistent with its age, Please see scans! Title- RZS and zoo symbol. Dimensions –apprx. 18 x 11 mm. Material – brass. The pictures are from actual item that you will recieve. 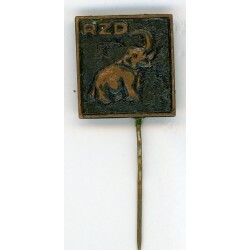 The Latvian soviet stick pin Rigas Zoo“RZD” in a good condition.Circa 80ies of 20th centure. Consistent with its age, Please see scans! Title- RZS and zoo symbol. Dimensions –apprx. 13 x 17 mm. Material – brass. The pictures are from actual item that you will recieve. 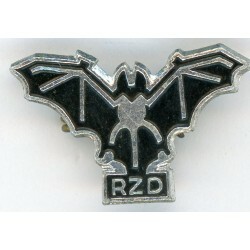 The Latvian soviet stick pin Rigas Zoo“RZD” in a good condition.Circa 80ies of 20th centure. Consistent with its age, Please see scans! Title- RZS and zoo symbol. Dimensions –apprx. 18 x 14 mm. Material – brass. The pictures are from actual item that you will recieve. 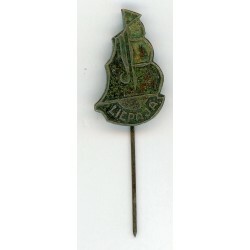 The Latvian soviet stick pin Rigas Zoo“RZD” in a good condition.Circa 80ies of 20th centure. Consistent with its age, Please see scans! Title- RZS and zoo symbol. Dimensions –apprx. 20 x 18 mm. Material – brass. The pictures are from actual item that you will recieve. 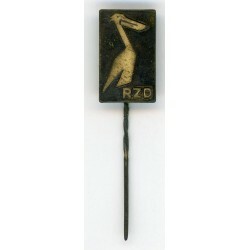 The Latvian soviet stick pin Rigas Zoo“RZD” in a good condition.Circa 80ies of 20th centure. Consistent with its age, Please see scans! Title- RZS and zoo symbol. Dimensions –apprx. 17 x 8 mm; owl`s form. Material – brass. The pictures are from actual item that you will recieve. 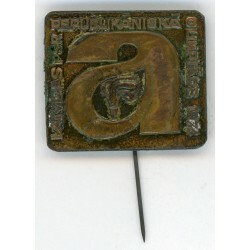 The Latvian soviet stick pin Rigas Zoo in a good condition.Circa 80ies of 20th centure. Consistent with its age, Please see scans! Title- RZS and zoo symbol. Dimensions –apprx. 15 x 11 mm. Material – brass. The pictures are from actual item that you will recieve. The Latvian soviet stick pin Rigas Zoo in a good condition.Circa 80ies of 20th centure. Consistent with its age, Please see scans! Title- RZS and zoo symbol. Dimensions –apprx. 39 x 15 mm. Material – brass. The pictures are from actual item that you will recieve. 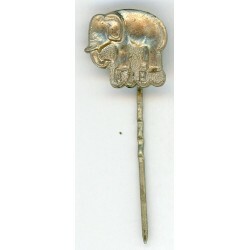 The Latvian soviet stick pin Rigas Zoo in a good condition.Circa 80ies of 20th centure. Consistent with its age, Please see scans! Title- Riga zoo symbol. Dimensions –apprx. 39 x 17 mm. Material – brass. The pictures are from actual item that you will recieve. The Latvian soviet stick pin Rigas Zoo in a good condition.Circa 80ies of 20th centure. Consistent with its age, Please see scans! Title- RZS and zoo symbol. Dimensions –apprx. 13 x 12 mm. Material – alpaca. The pictures are from actual item that you will recieve. 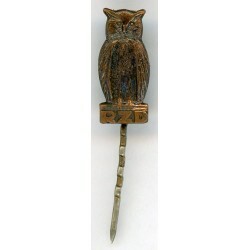 The Latvian soviet stick pin Rigas Zoo in a good condition.Circa 70ies of 20th centure. Consistent with its age, Please see scans! 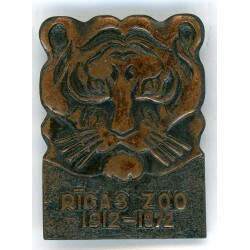 Title- Rīgas ZOO 1912-1972 and zoo symbol. Dimensions –apprx. 34 x 26 mm. Material – brass. The pictures are from actual item that you will recieve. The Latvian soviet stick pin Rigas Zoo in a good condition.Circa 80ies of 20th centure. Consistent with its age, Please see scans! 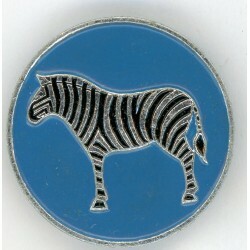 Title- Rīgas zoo symbol. Dimensions –apprx. diameter 26 mm. Material – brass, enamel. The pictures are from actual item that you will recieve. 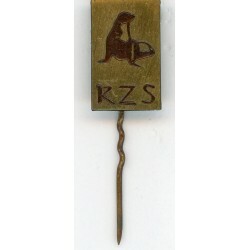 The Latvian soviet stick pin Rigas Zoo in a good condition.Circa 80ies of 20th centure. Consistent with its age, Please see scans! Title- Rīgas ZOO and zoo symbol. Dimensions –apprx. 25 x 19 mm. Material – brass. The pictures are from actual item that you will recieve. The Latvian soviet stick pin LATVIJA in a good condition.Circa 70ies-80ies of 20th centure. Consistent with its age, Please see scans! Title- Latvija and national symbol. Dimensions –apprx. 16 x 16 mm. Material – brass. The pictures are from actual item that you will recieve. 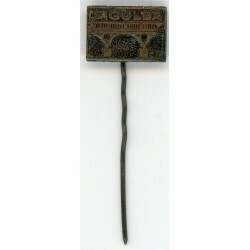 The Latvian soviet stick pin LATVIJA in a good condition.Circa 70ies-80ies of 20th centure. Consistent with its age, Please see scans! Title- Latvija and national symbol. Dimensions –apprx. diameter 24 mm. 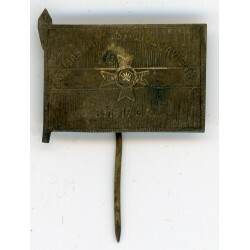 Material – brass,enamel. The pictures are from actual item that you will recieve. 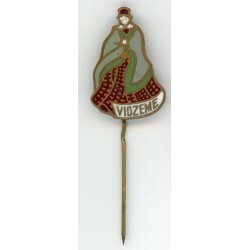 The Latvian soviet stick pin VIDZEME in a good condition.Circa 70ies-80ies of 20th centure. Consistent with its age, Please see scans! Title- Vidzeme and national symbol. Dimensions –apprx. 25 x 14 mm. Material – brass,enamel. The pictures are from actual item that you will recieve. The Latvian soviet stick pin LATVIJA in a good condition.Circa 70ies-80ies of 20th centure. Consistent with its age, Please see scans! Title- Latvija and national symbol. Dimensions –apprx. 11 x 10mm. Material – plastic. The pictures are from actual item that you will recieve. 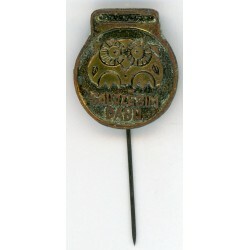 The Latvian soviet stick pin LATVIJAS PSR in a good condition.Circa 70ies-80ies of 20th centure. Consistent with its age, Please see scans! Title- Latvijas PSR and national symbol. Dimensions –apprx. 22 x 13mm. Material – alpaca,enamel. The pictures are from actual item that you will recieve. 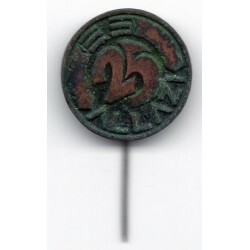 The Latvian soviet stick pin LATVIJA in a good condition.Circa 60ies-70ies of 20th centure. Consistent with its age, Please see scans! 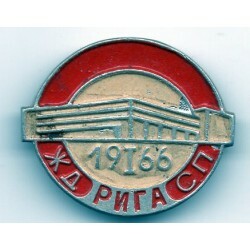 Title- Latvija; 1968 and national symbol. Dimensions –apprx. 13 x 19mm. Material – brass. The pictures are from actual item that you will recieve. 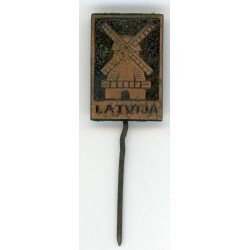 The Latvian soviet stick pin LATVIJA in a good condition.Circa 70ies-80ies of 20th centure. Consistent with its age, Please see scans! Title- Latvija and national symbol. Dimensions –apprx. 19 x 13 mm. Material – brass. The pictures are from actual item that you will recieve. 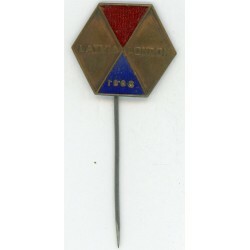 The Latvian soviet stick pin 1967 in a good condition.Circa 60ies-70ies of 20th centure. Consistent with its age, Please see scans! Title- 1967 and national symbol. Dimensions –apprx. 25 x 13 mm. Material – brass. The pictures are from actual item that you will recieve. Latvian soviet stick pin "Saudzesim dabu"
The Latvian soviet stick pin SAUDZĒSIM DABU in a good condition.Circa 70ies-80ies of 20th centure. Consistent with its age, Please see scans! Title- Saudzesim Dabu and national symbol. Dimensions –apprx. 21 x 18 mm. Material – brass. The pictures are from actual item that you will recieve. 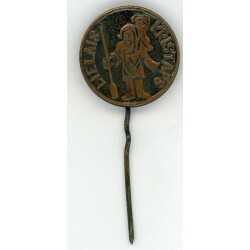 The Latvian soviet stick pin Lielais Kristaps in a good condition.Circa 70ies-80ies of 20th centure. Consistent with its age, Please see scans! Title- Lielais Kristaps and national symbol. Dimensions –apprx.diameter 18 mm. Material – brass. The pictures are from actual item that you will recieve. The Latvian soviet stick pin LATVIA HELSINKI 1970 in a good condition. Circa 70ies-80ies of 20th centure. Consistent with its age, Please see scans! Title- Latvia Helsinki 1970 and national symbol. Dimensions –apprx. diameter 23 mm. Material – brass. The pictures are from actual item that you will recieve. 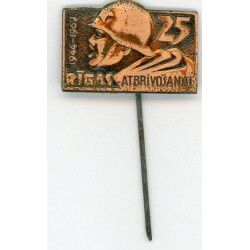 The Latvian soviet stick pin Rīgas Atbrīvošanai 25 in a good condition. Circa 60ies-70ies of 20th centure. Consistent with its age, Please see scans! Title- 1944-1969 and national symbol. Dimensions –apprx. 16 x 26 mm. Material – brass. The pictures are from actual item that you will recieve. 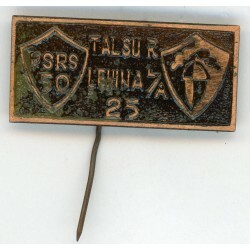 The Latvian soviet stick pin PSRS 50 in a good condition.Circa 60ies-80ies of 20th centure. Consistent with its age, Please see scans! Title- Talsu R ,Ļeņina L/A 25 and national symbol. Dimensions –apprx. 19 x 32 mm. Material – brass. The pictures are from actual item that you will recieve. 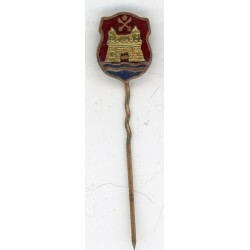 The Latvian soviet stick pin Latvijas Republikāniskā Olimpiāde 1974 in a good condition. Circa 70ies-80ies of 20th centure. Consistent with its age, Please see scans! Title- Olimpiāde 1974 and national symbol. Dimensions –apprx. 23 x 29 mm. Material – brass. The pictures are from actual item that you will recieve. 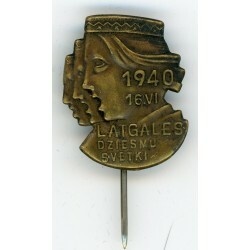 The Latvian soviet stick pin" Sigulda 1977 10 gadi" in a good condition.Circa 70ies-80ies of 20th centure. Consistent with its age, Please see scans! Title- Sigulda 1977 and national symbol. Dimensions –apprx. 23 x 38 mm. Material – brass. The pictures are from actual item that you will recieve. 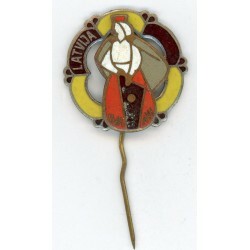 The Latvian soviet stick pin LATVIA LONDON 1968 in a good condition. Circa 60ies-70ies of 20th centure. Consistent with its age, Please see scans! Title- Latvia LOndon 1968. Dimensions –apprx. 20 x 23 mm. 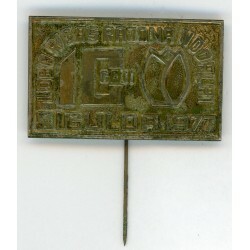 Material – brass,enamel. The pictures are from actual item that you will recieve. 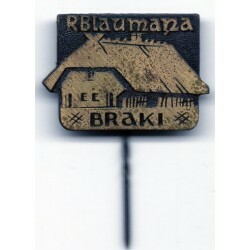 The Latvian soviet stick pin “R.Blaumaņa Braki ” in a good condition.Circa 80ies of 20th centure. Consistent with its age, Please see scans! Title- R.Blaumaņa Braki . Dimensions –apprx. 21 x 17 mm. Material – brass. The pictures are from actual item that you will recieve. 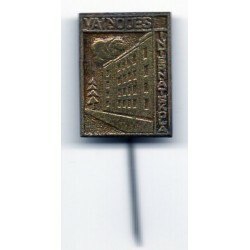 The Latvian soviet stick pin "J.Vītola Anniņas" in a good condition.Circa 80ies of 20th centure. Consistent with its age, Please see scans! Title- J.Vītola Anniņas. Dimensions –apprx. 20 x 18 mm. Material – brass. The pictures are from actual item that you will recieve. The Latvian soviet stick pin "Lauči Leons Paegle" in a good condition.Circa 80ies of 20th centure. Consistent with its age, Please see scans! Title- "Lauči Leons Paegle". Dimensions –apprx. diametr 23 mm. Material – brass. The pictures are from actual item that you will recieve. The Latvian soviet stick pin "Raiņa kapi"
The Latvian soviet stick pin (mini) “Raiņa kapi” in a good condition.Circa 80ies of 20th centure. Consistent with its age, Please see scans! Title- Raiņa kapi. Dimensions –apprx. 14 x 9 mm. Material – brass. The pictures are from actual item that you will recieve. 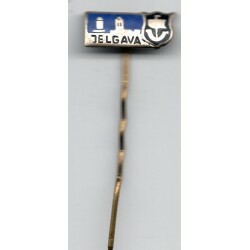 The Latvian soviet stick pin "Jelgava"
The Latvian soviet stick pin “Jelgava” in a good condition.Circa 80ies of 20th centure. Consistent with its age, Please see scans! Title- Jelgava. Dimensions –apprx. 16 x 15 mm. Material – brass, blue enamel. The pictures are from actual item that you will recieve. The Latvian soviet stick pin “Ķemeri” in a good condition.Circa 80ies of 20th centure. Consistent with its age, Please see scans! Title- Ķemeri and national symbols. Dimensions –apprx. 26 x 20 mm. Material – brass. The pictures are from actual item that you will recieve. 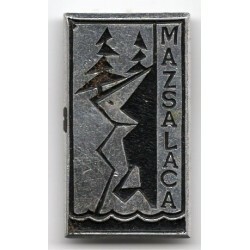 The Latvian soviet stick pin “Mazsalaca" in a good condition.Circa 80ies of 20th centure. Consistent with its age, Please see scans! Title- Mazsalaca. Dimensions –apprx. 17 x 30 mm. Material – brass. The pictures are from actual item that you will recieve. 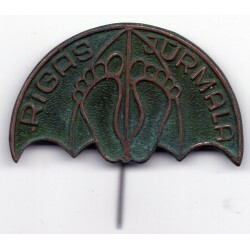 The Latvian soviet stick pin “Rīgas Jūrmala” in a good condition.Circa 80ies of 20th centure. Consistent with its age, Please see scans! Title- Rīgas Jūrmala. 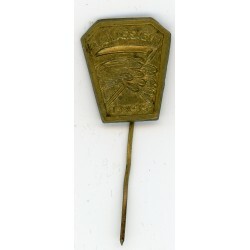 Pin shaped like an umbrella. Dimensions –apprx. diameter 47 mm. Material – brass. The pictures are from actual item that you will recieve. 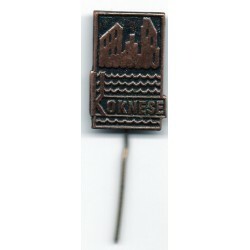 The Latvian soviet stick pin “Koknese” in a good condition.Circa 80ies of 20th centure. Consistent with its age, Please see scans! Title- Koknese. Dimensions –apprx. 16 x 25 mm. Material – brass. The pictures are from actual item that you will recieve. 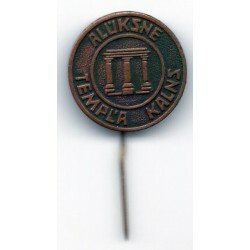 The Latvian soviet stick pin “Alūksne Tempļa kalns” in a good condition.Circa 80ies of 20th centure. Consistent with its age, Please see scans! Title- Alūksne Tempļa kalns. Dimensions –apprx. diameter 20 mm. Material – brass. The pictures are from actual item that you will recieve. 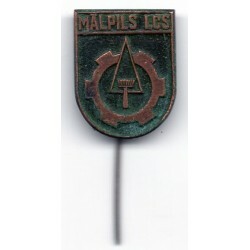 The Latvian soviet stick pin “Mālpils LCS ” in a good condition.Circa 80ies of 20th centure. Consistent with its age, Please see scans! Title- Mālpils LCS. Dimensions –apprx. 21 x 16 mm. Material – brass. The pictures are from actual item that you will recieve. 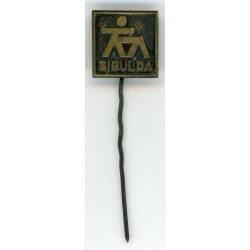 The Latvian soviet stick pin “Sigulda" in a good condition.Circa 80ies of 20th centure. Consistent with its age, Please see scans! Title- Sigulda. Dimensions –apprx. 14 x 25 mm. Material – brass. The pictures are from actual item that you will recieve. 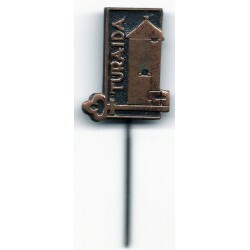 The Latvian soviet stick pin “Turaida” in a good condition.Circa 80ies of 20th centure. Consistent with its age, Please see scans! Title- Turaida. Dimensions –apprx. 19 x 10 mm. Material – brass. The pictures are from actual item that you will recieve. 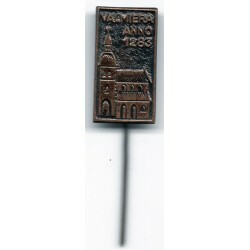 The Latvian soviet stick pin “Valmiera Anno 1283” in a good condition.Circa 80ies of 20th centure. Consistent with its age, Please see scans! Title- Valmiera Anno 1283. Dimensions –apprx. 21 x 12 mm. Material – brass. The pictures are from actual item that you will recieve. 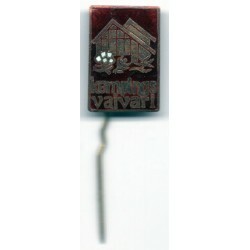 The Latvian soviet stick pin “Kempings Vaivari” in a good condition.Circa 80ies of 20th centure. Consistent with its age, Please see scans! Title- Kempings Vaivari. Dimensions –apprx. 18 x 20 mm. 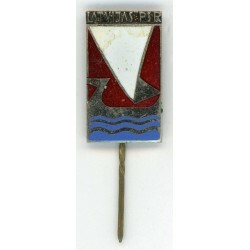 Material – brass; red enamel. The pictures are from actual item that you will recieve. 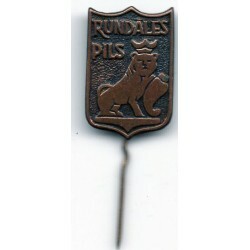 The Latvian soviet stick pin “Rundāles Pils” in a good condition.Circa 80ies of 20th centure. Consistent with its age, Please see scans! Title- Rundāles Pils and symbols. Dimensions –apprx. 14 x 21 mm. Material – brass. The pictures are from actual item that you will recieve. 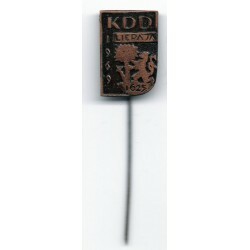 The Latvian soviet stick pin “KDD Liepāja 1625” in a good condition.Circa 80ies of 20th centure. Consistent with its age, Please see scans! Title- KDD Liepāja 1625 and symbols. Dimensions –apprx. 13 x 19 mm. Material – brass. The pictures are from actual item that you will recieve. The Latvian soviet stick pin (mini) “Gulbenes RCI” in a good condition.Circa 80ies of 20th centure. Consistent with its age, Please see scans! 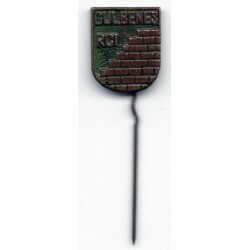 Title- Gulbenes RCI. Dimensions –apprx. 11 x 14 mm. Material – brass. The pictures are from actual item that you will recieve. 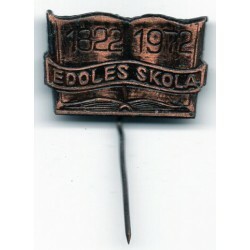 The Latvian soviet stick pin “Ēdoles skola ” in a good condition.Circa 80ies of 20th centure. Consistent with its age, Please see scans! Title- Ēdoles skola 1822-1972 and symbols. Dimensions –apprx. 14 x 22 mm. Material – brass. The pictures are from actual item that you will recieve. 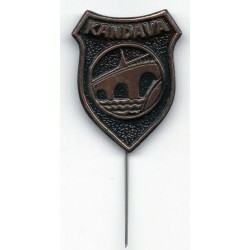 The Latvian soviet stick pin “Kandava” in a good condition.Circa 80ies of 20th centure. Consistent with its age, Please see scans! Title- Kandava. Dimensions –apprx. 16 x 22 mm. Material – brass. The pictures are from actual item that you will recieve. 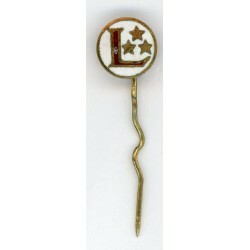 The Latvian soviet stick pin “Limbaži” in a good condition.Circa 80ies of 20th centure. Consistent with its age, Please see scans! Title- Limbaži 1223, symbols. Dimensions –apprx. 13 x 16 mm. Material – brass. The pictures are from actual item that you will recieve. 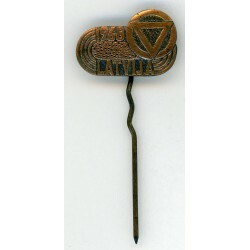 The Latvian soviet stick pin “Daugavpils” in a good condition.Circa 80ies of 20th centure. Consistent with its age, Please see scans! Title- Daugavpils 1275; symbols. Dimensions –apprx. 13 x 15 mm. Material – brass. The pictures are from actual item that you will recieve. 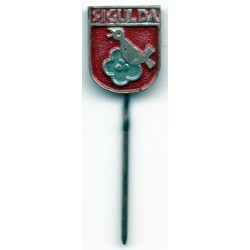 The Latvian soviet stick pin (mini) “Sigulda” in a good condition.Circa 80ies of 20th centure. Consistent with its age, Please see scans! Title- Sigulda. Dimensions –apprx. 13 x 14 mm. Material – brass. The pictures are from actual item that you will recieve. 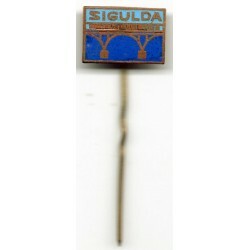 The Latvian soviet stick pin “Sigulda” in a good condition.Circa 80ies of 20th centure. Consistent with its age, Please see scans! Title- Sigulda; symbols. Dimensions –apprx. 10 x 14 mm. Material – brass. The pictures are from actual item that you will recieve. 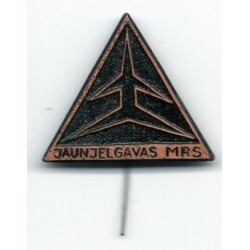 The Latvian soviet stick pin “Jaunjelgavas MRS” in a good condition.Circa 80ies of 20th centure. Consistent with its age, Please see scans! Title- Jaunjelgavas MRS; symbols. Dimensions –apprx. 11 x 12 mm. Material – brass. The pictures are from actual item that you will recieve. 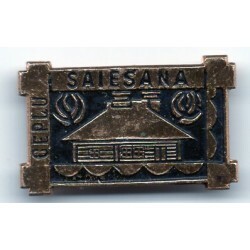 The Latvian soviet stick pin “Cepļu Saiešana” in a good condition.Circa 80ies of 20th centure. Consistent with its age, Please see scans! Title- Cepļu Saiešana and symbols. Dimensions –apprx. 25 x 14 mm. Material – brass. The pictures are from actual item that you will recieve. 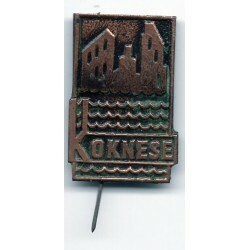 The Latvian soviet stick pin “Koknese” in a good condition.Circa 80ies of 20th centure. Consistent with its age, Please see scans! Title- Koknese;national symbols. Dimensions –apprx. 15 x 25 mm. Material – brass. The picture are from actual item that you will recieve. 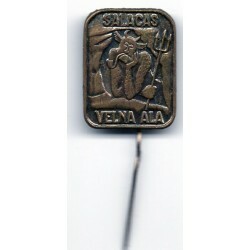 The Latvian soviet stick pin “Salacas Velna Ala” in a good condition.Circa 80ies of 20th centure. Consistent with its age, Please see scans! 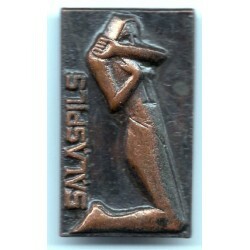 Title- Salacas Velna Ala. Dimensions –apprx. 16 x 22 mm. Material – brass. The pictures are from actual item that you will recieve. The Latvian soviet stick pin “c” in a good condition.Circa 80ies of 20th centure. Consistent with its age, Please see scans! Title- Vaiņodes Internātskola. Dimensions –apprx. 14 x 20 mm. Material – brass. The pictures are from actual item that you will recieve. 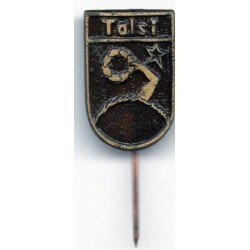 The Latvian soviet stick pin “Talsi” in a good condition.Circa 80ies of 20th centure. Consistent with its age, Please see scans! Title- Talsi. Dimensions –apprx. 12 x 19 mm. Material – brass. The pictures are from actual item that you will recieve. The Latvian soviet stick pin “Sigulda” in a good condition.Circa 80ies of 20th centure. Consistent with its age, Please see scans! Title- Sigulda. Dimensions –apprx. 15 x 11 mm. Material – brass. 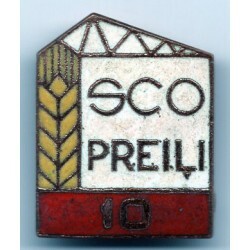 ; enamel. The pictures are from actual item that you will recieve. 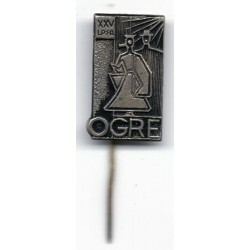 The Latvian soviet stick pin “Ogre” in a good condition.Circa 80ies of 20th centure. Consistent with its age, Please see scans! Title- Ogre. Dimensions –apprx. 11 x 20 mm. Material – brass. The pictures are from actual item that you will recieve. 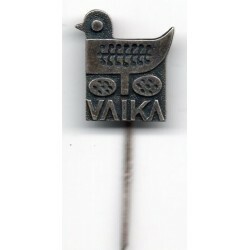 The Latvian soviet stick pin (mini) “Valka” in a good condition.Circa 80ies of 20th centure. Consistent with its age, Please see scans! Title- Valka; national symbols. Dimensions –apprx. 11 x 15 mm. Material – brass. The pictures are from actual item that you will recieve. The Latvian soviet stick pin “Ķemeri” in a good condition.Circa 80ies of 20th centure. Consistent with its age, Please see scans! Title- Ventspils. Dimensions –apprx. 9 x 19 mm. Material – brass. The pictures are from actual item that you will recieve. 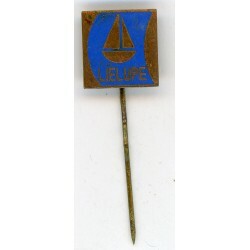 The Latvian soviet stick pin “Allaži” in a good condition.Circa 80ies of 20th centure. Consistent with its age, Please see scans! Title- Allaži 25. Diameter –apprx. 20 mm. Material – brass. The pictures are from actual item that you will recieve. 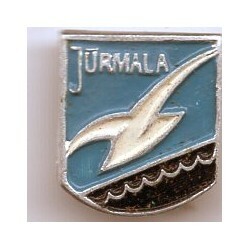 The Latvian soviet stick pin (mini) “Jūrmala” in a good condition.Circa 80ies of 20th centure. Consistent with its age, Please see scans! 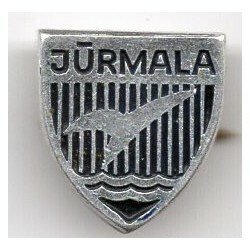 Title- Jūrmala. Dimensions –apprx. 14 x 15 mm. Material – brass. The pictures are from actual item that you will recieve. 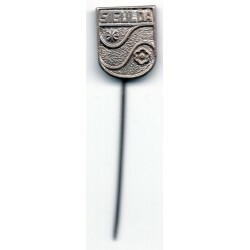 The Latvian soviet stick pin (mini) “Jūrmala” in a good condition.Circa 80ies of 20th centure. Consistent with its age, Please see scans! Title- Jūrmala. Dimensions –apprx. 13 x 13 mm. Material – brass. The pictures are from actual item that you will recieve. The Latvian soviet stick pin “Rīga” in a good condition.Circa 80ies of 20th centure. Consistent with its age, Please see scans! 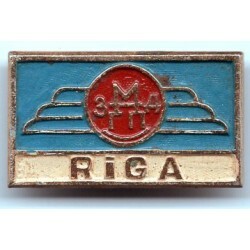 Title- Riga with its city symbols Dimensions –apprx. 31 x 31 mm. Material – brass. The pictures are from actual item that you will recieve. 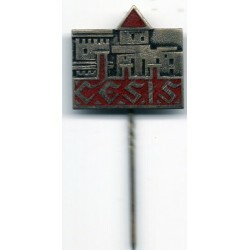 The Latvian soviet stick pin “Cēsis” in a good condition.Circa 80ies of 20th centure. Consistent with its age, Please see scans! Title- Cesis with its city symbols. Dimensions –apprx. 13 x 18 mm. Material – brass. The pictures are from actual item that you will recieve. 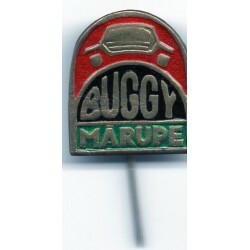 The Latvian soviet stick pin “Marupe"" in a good condition.Circa 80ies of 20th centure. Consistent with its age, Please see scans! Title- Mārupe BUGGY . Dimensions –apprx. 21 x 19 mm. Material – brass. The pictures are from actual item that you will recieve. 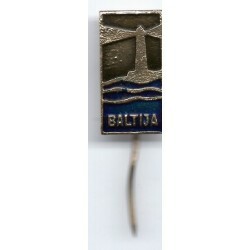 The Latvian soviet stick pin“Baltija” in a good condition.Circa 80ies of 20th centure. Consistent with its age, Please see scans! Title- Baltija. Dimensions –apprx. 19 x 10 mm. Material – brass. The pictures are from actual item that you will recieve. 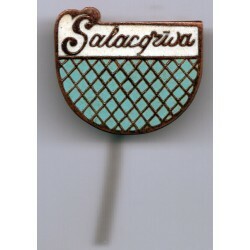 The Latvian soviet stick pin “Salacgŗiva” in a good condition.Circa 80ies of 20th centure. Consistent with its age, Please see scans! Title- Salacgrīva. Dimensions –apprx. 19 x 26 mm. Material – brass. The picture are from actual item that you will recieve. 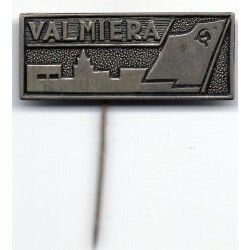 The Latvian soviet stick pin “Valmiera” in a good condition.Circa 80ies of 20th centure. Consistent with its age, Please see scans! Title- Valmiera with its city symbols. Dimensions –apprx. 12 x 31 mm. Material – brass. The pictures are from actual item that you will recieve. 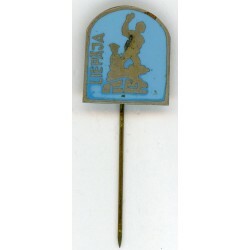 The Latvian soviet stick pin “Krāslava” in a good condition.Circa 80ies of 20th centure. Consistent with its age, Please see scans! Title- Kraslava BMS with its city symbols. Dimensions –apprx. 21 x 16 mm. Material – brass. The pictures are from actual item that you will recieve. 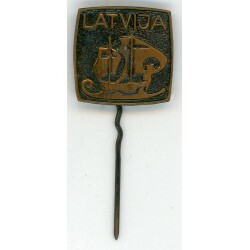 The Latvian soviet stick pin “Riga” in a good condition.Circa 80ies of 20th centure. Consistent with its age, Please see scans! Title- Riga with its city symbols. Dimensions –apprx. 22 x 17 mm. Material – brass. The pictures are from actual item that you will recieve. The Latvian soviet stick pin “Stucka” in a good condition.Circa 80ies of 20th centure. Consistent with its age, Please see scans! Title- Stucka with its city symbols. Dimensions –apprx. 22 x 17 mm. Material – brass. The pictures are from actual item that you will recieve. 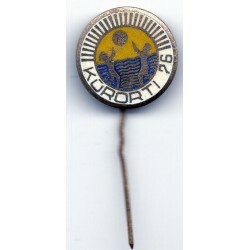 The Latvian soviet stick pin “Kurorti 76” in a good condition.Circa 80ies of 20th centure. Consistent with its age, Please see scans! Title- Kurorti 76 with its symbols. Dimensions – diameter apprx. 19 mm. Material – brass. The pictures are from actual item that you will recieve. 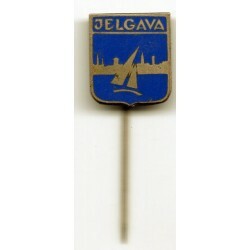 The Latvian soviet stick pin (mini) “Jelgava” in a good condition.Circa 80ies of 20th centure. Consistent with its age, Please see scans! Title- Jelgava with its city symbols. Dimensions –apprx. 6 x 15 mm. Material – brass. The pictures are from actual item that you will recieve. 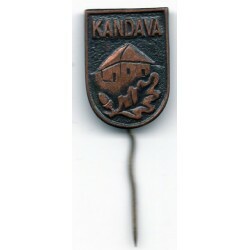 The Latvian soviet stick pin “Kandava” in a good condition.Circa 80ies of 20th centure. Consistent with its age, Please see scans! Title- Kandava with its city symbols. Dimensions –apprx. 14 x 20 mm. Material – brass. The pictures are from actual item that you will recieve. 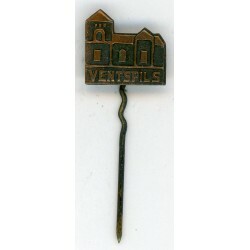 The Latvian soviet stick pin “Ventspils” in a good condition.Circa 80ies of 20th centure. Consistent with its age, Please see scans! Title- Ventspils with its city symbols. Dimensions –apprx. 19 x 17 mm. Material – brass. The pictures are from actual item that you will recieve. 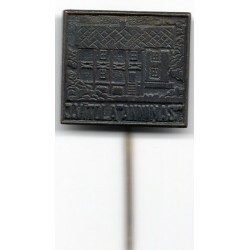 The Latvian soviet stick pin “Salaspils” in a good condition.Circa 80ies of 20th centure. Consistent with its age, Please see scans! Title- Salaspils with its city symbols. Dimensions –apprx. 28 x 16 mm. Material – brass. The pictures are from actual item that you will recieve. The Latvian soviet stick pin “Rīga” in a good condition.Circa 80ies of 20th centure. Consistent with its age, Please see scans! 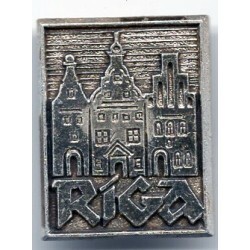 Title- Riga with its city symbols. Dimensions –apprx. 14 x 25 mm. Material – brass. The pictures are from actual item that you will recieve. 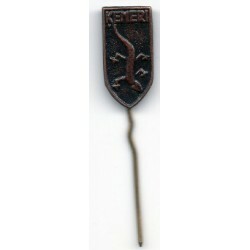 The Latvian soviet stick pin “LPSR” in a good condition.Circa 80ies of 20th centure. Consistent with its age, Please see scans! 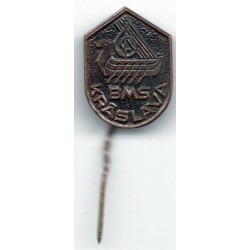 Title- LPSR with its country symbols. Dimensions –apprx. 18 x 21 mm. Material – brass. The pictures are from actual item that you will recieve. 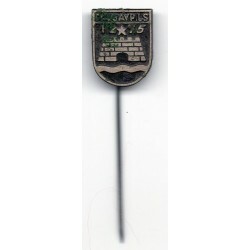 The Latvian soviet stick pin “Riga 1966” in a good condition.Circa 80ies of 20th centure. Consistent with its age, Please see scans! 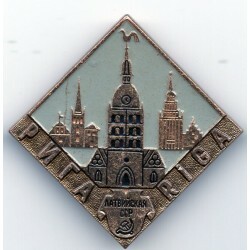 Title- Riga 1966 with its city symbols. Dimensions – apprx. 22 x 28 mm. Material – brass. The pictures are from actual item that you will recieve.